Tony Boloney’s Food Truck: Food Of The Gods | DidjaEat? ← Atlantic City Beer Fest & Giveaway!! A little while ago, I had the pleasure of attending the Atlantic City Beer Fest. It was pretty awesome. Lots of beers from all over the world, friendly people, beer themed oddities to buy and food to eat. Wait?…Food to eat? Well, yeah. You can’t have a whole giant convention floor full of beer and not offer food, that would be wrong. Or, more succinctly, it would result in some very drunk people driving their cars into the ocean. That’s not good for anyone. There were lots of different food vendors selling everything from crabcake sliders to yelp offering pretzel necklaces to kielbasie sandwiches. But I was more interested in the truck with the curly moustaches on it. Normally, when people start blabbing on their website about how good their sandwiches are, I tend to automatically roll my eyes. I am from sandwich-land, aka Philly, and it is real hard for me to accept boasts from others about these things. Even with pizza, I feel the same way. There is something in the water here that makes for fantastic bread (and, of course, dough. Doh!). I don’t know what it is (nor do I want to know, save your emails), but you can’t find it anywhere else. AC. They obviously understand branding and food, because the menu for the shop is like 4 pages long and every single thing is a different spin on favorites (Like meat on a pizza? Try the Casino Carnivore with “every animal noah brought on his ark ravaged by mozzarella”) as well as things I never would have even thought to make (Reuben Fries!). when they come to empty their pockets and stuff their faces full of famous chef restaurant food (not that there is anything wrong with that, but there is much more to the city then that). 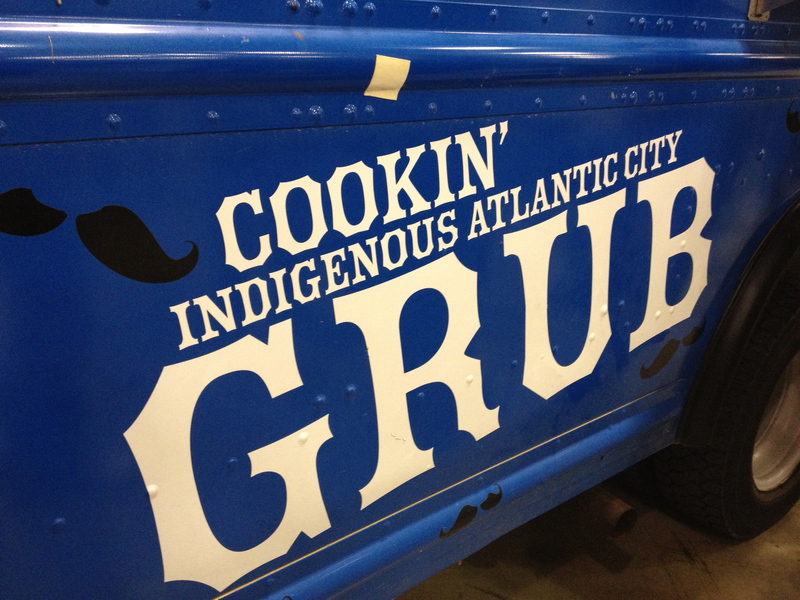 Their slogan “Indigenous Atlantic City Grub” hammers that home in a mouth watering way! 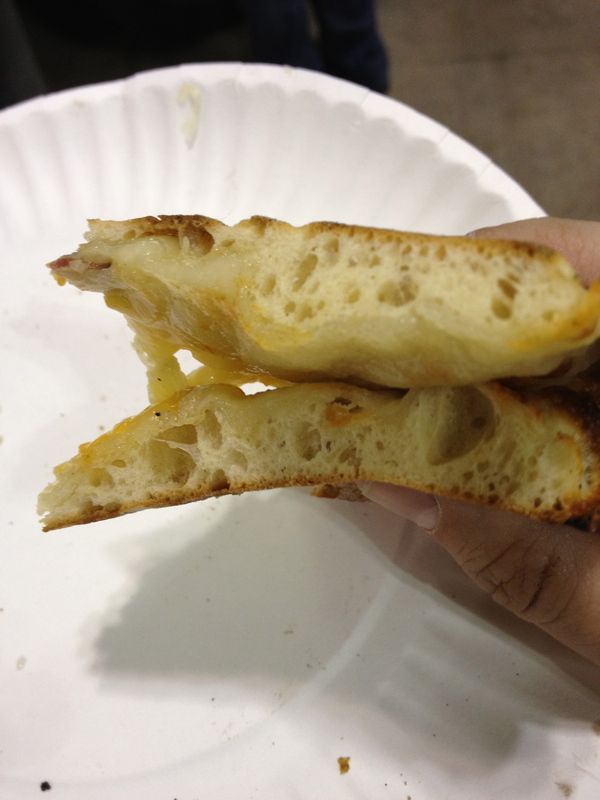 When I made my way over to the truck, I was impressed with the smartness of the menu: pizza and the cheesesteal ole’. People who are drinking love pizza and cheesesteaks! They had a bunch of pizza options, but as soon as I heard it, I knew I had to try it. What was it? Reuben Pizza! Say what? That sounds odd. That sounds weird. That sounds…delicious. And you know what? IT WAS! 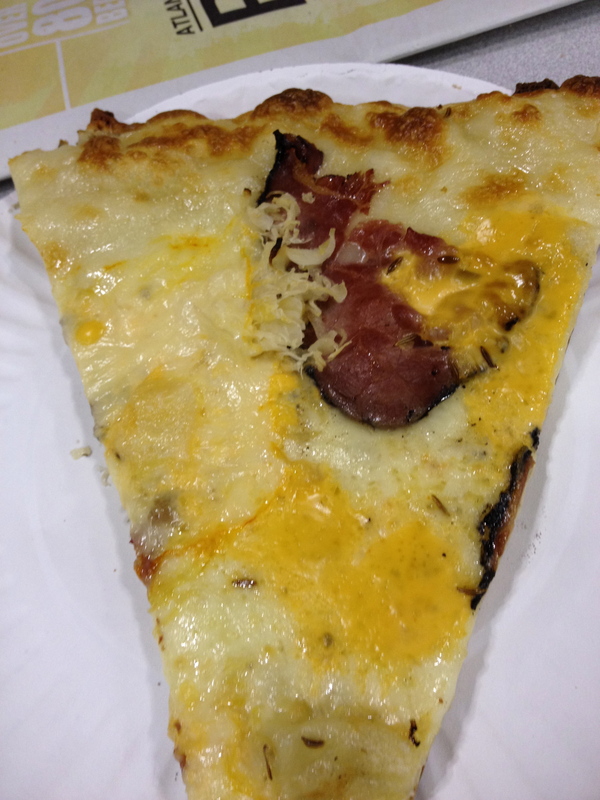 The Reuben pizza would have been something terribly simple to totally screw up. How much kraut do you put on? Do you just use a squeeze bottle to put the dressing on all around? Or do you use it like sauce and cover the whole pie? Do you cover the whole pie with corned beef like you do with pepperoni? The questions are endless! (seriously people, I need a life.) I think they nailed it. They used a 2 cheese blend to keep the pizza from tasting flat. under the meat, there is kraut, under that is a glob of the thousand island sauce that ooozes a bit but not too much. So ridiculously good. I had to physically restrain myself from getting another piece. I also really liked how they were having fun with the crowd. It got a little chaotic, so what did they do? They whipped out a bullhorn. There was no panicking (what I would have done. To the panicking! ), no freaking out, just a little louder and they kept on cranking out some awesome pizza! I realized, after awhile, that I wanted to try the cheesesteak: The Cheesesteak Ole’. 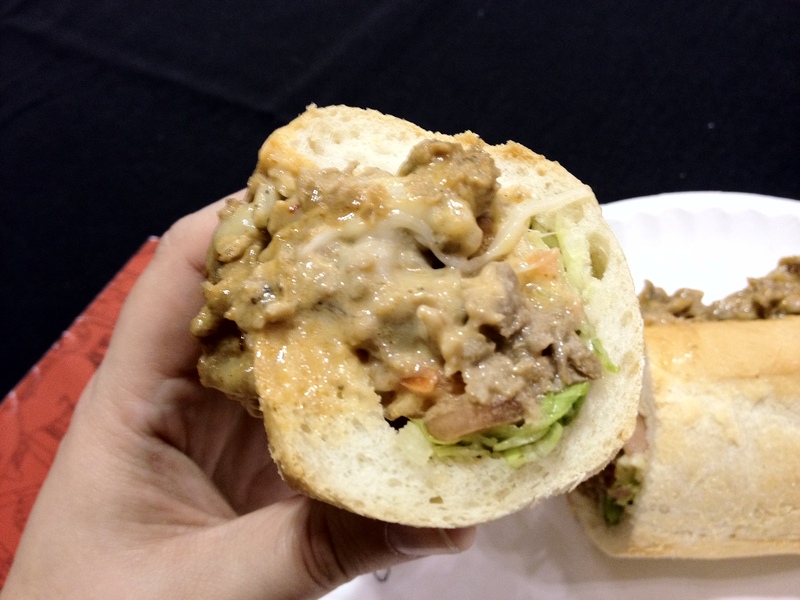 This thing had apparently won some kind of 2010 Guy Fieri Cheesesteak Battle. (An aside: I find it funny that a guy from Northern California can put his name anywhere around something called “cheesestesk” because, um, that’s all that is wrong with the world.). This thing was awesome. It might be a tad small, length wise, if compared to what we can get in Philly, but make no mistake, this thing si PACKED with meat. Is it more like a cheesesteak hoagie then a cheesesteak because it has lettuce and tomato on it as well as the cheese and steak? Probably. 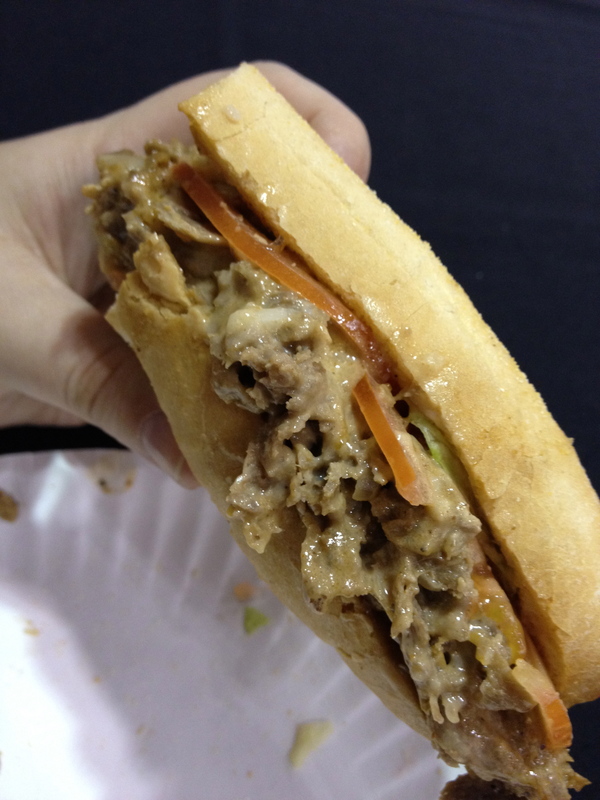 But honesty, I could not care less, because this cheesesteak was fantastic. Let’s start with the steak. Chopped sirloin. A little different then the usual meat used, which is a thinly sliced ribeye, but it’s cooked tender with a 10 spice mix. It’s a kind of taco spice that works deliciously with the jack and chipotle house sauce. Have no doubt, this thing is cheesy in all the right ways. It sticks with the meat, not like a weird cheese “sauce” you see sometimes, and it doesn’t sink to the bottom of the roll either. I was a little thrown by the lettuce and tomato on the bottom (nice and fresh too), but it gave the cheesesteak a nice bit of texture. Finally, the roll was chewy but not too chewy, and really fresh. Those Atlantic City rolls are no joke! 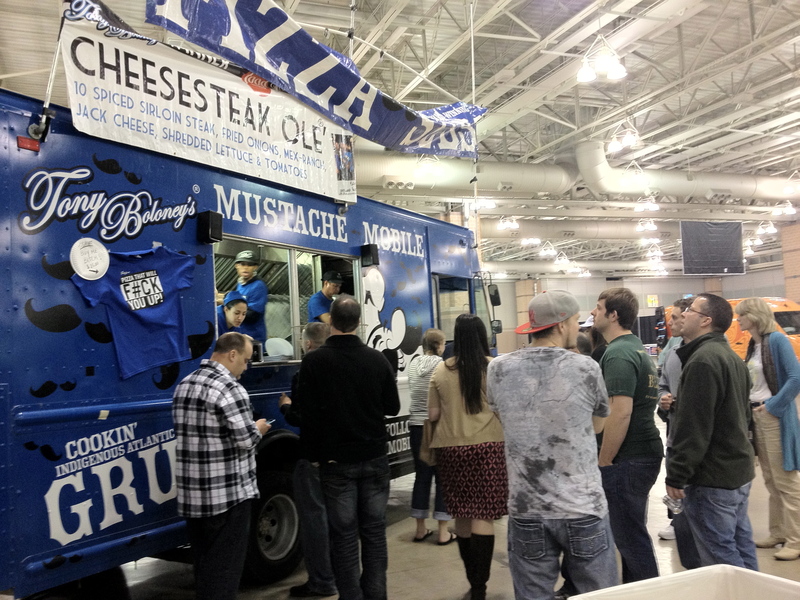 Wrapping this rambling review up: if you find the Tony Boloney Moustache Truck anywhere you are, go grab some food! If you find yourself in Atlantic City, wander on over to 300 Oriental Avenue (by the new Revel Casino) and go grab some grub. This place is awesome and while I wish I lived closer to them, I’m kind of glad I don’t, because I really can’t afford bigger pants. My hat is off to the Tony Boloney guys! Go now! Go! Posted on April 12, 2012, in boardwalk food, condiments, food truck, pizza place food, restaurants, sandwiches and tagged atlantic city beer fest 2012, atlantic city food, cheesesteak, cheesesteak ole, food, guy fieri, moustache mobile, restaurants, reuben fries, reuben pizza, sandwich land, tony boloney's, travel, vacation. Bookmark the permalink. 1 Comment. Pingback: Tony Boloney Nails It « DidjaEat?